Ashwagandha -This rejuvenating ingredient supports endurance, calmness and strength. Morpheme Ashwagandha contains 500mg Pure Extract. 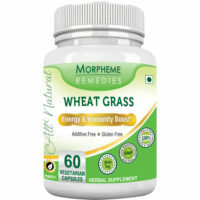 It has been formulated in Vegetarian Capsules and manufactured in GMP certified facility. Serving size: 1 Veg capsule Servings per container: 60 Each 500 mg capsule contains: Ashwagandha Extract 10:1 Each Bottle Contains: 60 Vegi Caps Suggested Usage: 1 Capsule twice daily after meals. Other Ingredients: Capsule(Vegetarian Capsule), 100% Vegetarian. No Fillers, binders or common Allergens. Morpheme Ashwagandha capsules contains 100% extract of the herb Ashwagandha. It is manufactured using the latest equipment and technology and passes through minimum human intervention and hence the product reaches you in the most pure form. It is a safe herbal tablet for human consumption.